Pack it in, pack it out—this is a key principle in leaving no trace, something every hiker and camper should be familiar with. It’s not only the courteous thing to do, but it keeps our campgrounds and trails looking nice and clean for years to come. To be fair, nobody wants to camp or hike somewhere with a bunch of smelly, fly-ridden trash all over the place. Sadly, not everyone has gotten this message. 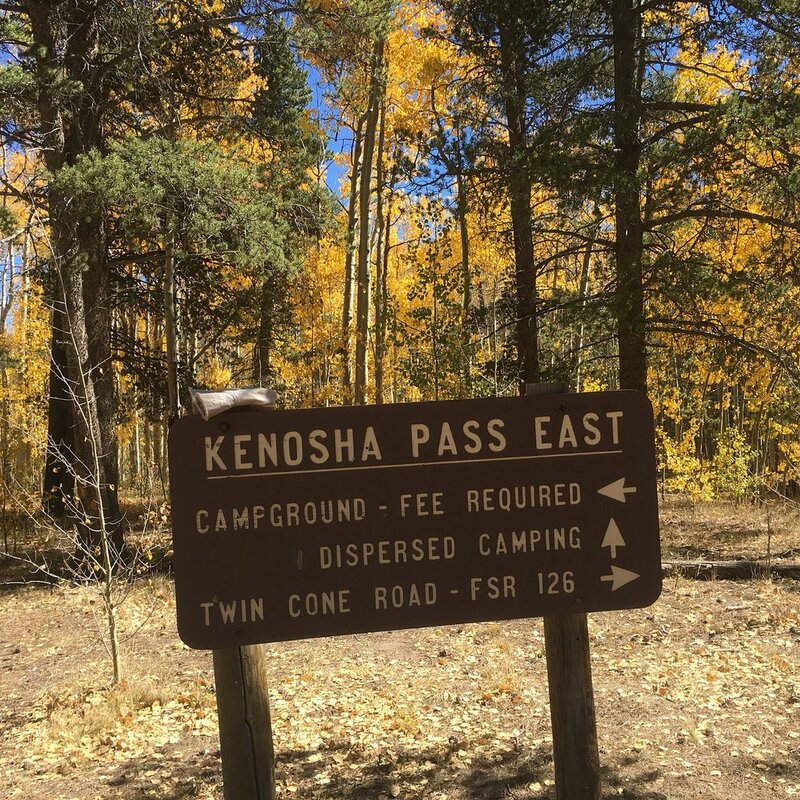 Recently, Kenosha Pass Campground in Colorado’s Rocky Mountains—a popular place to see fall color—has been littered with garbage almost daily. The excessive maintenance has now caused the bathroom facilities to close down indefinitely. With the bathrooms closed, and no dumpster available, campers left trash around the closed bathrooms, the parking lot, and on the trail. There is only one solution, and it’s very simple: bringing a trash bag and picking up after yourself. If there are no bins or dumpsters available, be responsible and take your garbage with you until you can find another place to dispose of it. If you’re a dog owner, don’t bag up your dog’s poop and just leave it on the ground for somebody else to deal with. Take the bag with you until you see the nearest garbage bin where you can toss it. Dealing with your pet’s waste is simply part of being a pet owner. But don’t just stop there. Go ahead and pick up random pieces of garbage along the trail or at your campsite as you see them, even if they weren’t yours. The campgrounds and trails are for all of us, and it is up to all of us to keep them clean so we can continue enjoying them in the future. If you have an RV but no designated spot for your trash, you might find an over-the-door bag holder to be very useful. These holders can fit over most standard-sized cabinet doors and will keep your trash bag out of sight and out of the way. Another solution for both tent and RV campers is a pop-up trash can that can easily be collapsed and stored away when it’s empty. Read more tips from Do It Yourself RV on dealing with trash in your RV. I always make a point of leaving my area cleaner than when I arrived. Just got back from Bass Lake , Ca. and could not believe how many people think the world is their toilet and it is only getting worse. We picked up 2 bags of recycle and a bag of trash in the limited area we were staying and playing. It is a sad statement for humans. You know,,,the most disturbing part of this situation is that most of the trash is from Colorado residents…not transient tourists. Having lived in beautiful Colorado several decades I was appalled at the lackadaisical attitude some locals took towards their environment be it with litter, trespass, fire or wildlife. Before the advent of aluminum, the state flower was a rusting Coors can but I believe this has been supplanted by the plastic bag & wrapper. It’s a damn shame the the folks living in arguably the most beautiful state in the country won’t take care of it’s beauty & are squandering their children’s inheritance. He’s right, the campground is very close to the Denver Metro and seems to be drawing an entitled clientele of me-me-me low life’s. It’s both disgusting and sad that people can be such inconsiderate pigs. You say there is only one solution”. No,, there are many possible solutions. This park charges a fee to get in, right? Instead of wasting that money studying tree rings, perhaps they could put out a few trash cans???? And what when they are filled just pile it on the ground next to the trash can. More and more in this country have the mind and up bringing that not my problem and someone else will take care of it. Take responsibility for ones actions. Why bother with small trash cans, just put a roll-off dumpster there and empty it once a month. I am seeing this everywhere I go, in private and public campgrounds. My own pet peeve is dogs off leads. This looks like the work of homeless people and or drunks. Right, because people who have homes and don’t drink would NEVER leave a piece of trash laying around. Love the sarcasm! We are camphosts at a state park and are always amazed how much trash is on the ground, even though we have thoroughly cleaned that site. I wish I could say “if it is in your hand either eat it, put it in your trash can, or put it in your pocket”! It doesn’t matter if the guest has a $500,000 rig or a small tent. We love our campers and want to make their stay a pleasure. Doesn’t matter if you are homeless or live in a million dollar home, manners are cheap, everyone can afford them. All we need to do is clean up after ourselves. Simple as that. Pack it in, pack it out — it all starts with teaching and re-teaching people to have respect for the world and everyone/thing in it. Teach your kids to pick up. Include clean-up as part of learning a skill, like carpentry or cooking. My mom taught me to cook and said that cleaning the cooking area, as I finished a step, made clean-up lighter when I was done cooking. My dad, with carpentry, felt that checking tools, sharpening or oiling, and cleaning ensured that projects would go smoothly and tools would last longer. ….And sawdust could be sprinkled on the veggie gardens (untreated wood, of course). I’m amazed people would spent the day in a beautiful spot and not bring one trash bag and be prepared to take it out with them. Do you throw trash on the floor of your homes? Or out in the yard? The average person thinks there are squads of custodians that follow them around, perhaps a day or two after their departure. Not just at campgrounds, but anywhere they go whether city or country. So their filth will magically disappear for their return to their favorite site next year. Since land agencies like USFS or BLM don’t have the resources to put (bear proof) trash receptacles and campground hosts or rangers to babysit campers at every designated area, either more of us will have to act as Tom, above, or the affected sites closed off. We have to consider the affects on wildlife as well. For example, what happens to say, a bear or a coyote who chomps down that scrap of foil with those oh! so tantalizing scraps of human food and smells clinging to the aluminum? Unfortunately we have seen it all over the country. We stayed at a park in sd and people were too lazy to walk 50 ft to a dumpster instead filled up the fire ring with trash. We went to farm aid concerts and were appalled at the trash left behind. It is too bad. We have 3 dogs and we always pick up there gifts but I cannot count how many people don’t clean up. Walmart’s aren’t allowing overnights in many areas because of this trend. I feel like the Indian crying at the disrespect of Mother Nature!!! I think this is part of the reason that a lot of the Provincial Campgrounds in British Columbia were turned over to private companies to monitor. Unfortunately this has also resulted in higher fees. Unfortunately no trash cans in a drive-in campground may be an untenable policy. In an RV I can keep 2 days worth; I don’t have pet or childrens’ diapers. On remote hiking trails and canoe/walk-in camping, it would be expected to carry your trash out. 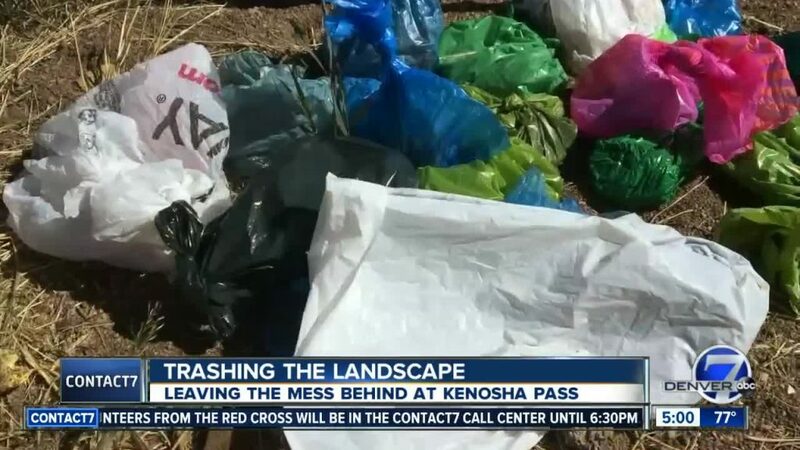 The Kenosha Pass Website does not prepare campers for the lack of trash bins. Its Amenities and Activities make it sound like it’s prepared for larger families on a site, and it’s a normal campground. NOTE: NOTE: They even state “Trash Collection”. I am guessing the volume of daytime city slickers, using the convenient campground vault toilets may be the largest generator of trash…whoever it is, it’s happening. I think some garbage collection for the year would be less than the $9600 cost of removal from the vault toilets. We generate lots of trash. Much unnecessarily. Do you know how many times you have to repeat yourself when you don’t want subway to put your sandwich in a plastic bag, when you tell McDonalds you are eating here (and they still stuff everything in a bag) or to keep Walmart from putting each item into a separate plastic bag. I swear, I can buy 8 items from Walmart and walk out with 9 bags. It’s hard to recycle organics, glass, plastic or aluminum while out. I don’t drink waters non-stop from new plastic bottles, but I do like my soda. Drove from Oregon to Minnesota. Almost impossible to find a rest area, gas station or a store that would recycle the aluminum cans. Worst was Oregon where I was charged a deposit of 10 cents per can, but they wouldn’t redeem my cans for 10 cents and they wouldn’t even take my cans for free. I’m getting old. Not sure there were ever good old days, but the current consumerism, burn baby burn, “clean coal”, pipelines for profit, and everybody is entitled to a large gas guzzling 4×4, with RV, ATV and boat is getting to me. There is no respect for private or public property and no respect for those with less (either by choice or luck). My wife and I buy these reusable bags at every major place that we have camped at, (Grand Canyon, Yellowstone, Custer State Park and many others. Then we keep those bags in our vehicle so that when we go into any store we take some bags with us. We then use those bags instead of allowing the store to use all of those stupid plastic bags. Every time we camp we haul our garbage to either the campground dumpster or into the local town dump with ever we find. We have one dog and she is always on a lease and we pickup after her. There are several state campground in South Carolina where we will not go to again because the officials do not enforce the lease law or force campers to clean up after theirselves. We choose where we camp and we alway clean up our sites before we leave. We have went into some state park camp sites during the past several years in different states and had to clean up the site before we could setup our camper. It is saddening to see the many parents out there that are teaching their kids to let the other guy clean up after them instead of teaching them to do the right thing. What is this world coming too. I wonder sometimes. These are the same cretins that leave poopy diapers in parking lots, empty ashtrays at stop lights, won’t take a shopping cart to a corral and generally live a life of entitlement. Too bad they sometimes come camping. Pretty sure there are more and more of these types every year. Too darn bad. I have a dog and bring a bucket (home depot bucket) and put his bagged poop in there and it sits in the bed of my truck. I also have one of those pop up trash cans for all my other trash. I think it should be taught in school for the “leave no trace”. I believe with the entitled kids we have these days there are a lot of other things that should be taught in school. It’s a sad, sad world we live in these days. This past summer we traveled from southern GA to central WA. We make a habit of picking up trash around our campsite, doing our best to leave no trace. This was the first time we made a point of keeping aluminum cans separate from the rest of the trash. We ended up with 4 large trash bags (32 gal) full of recyclable aluminum. It will be going in a recycler for cash in the next few weeks. As for trash, we probable filled in excess of 20 grocery bags and disposed of them in dumpsters at rest areas, campground, etc. The amount of trash out there is unbelievable. The average RVer is an out and out slob. It’s because we’ve raised a generation of self entitled slobs. We all want to avoid responsibility. It’s pretty simple actually: CLEAN UP AFTER YOURSELF! Maybe think of it as “exercise”? And another personal beef… cigarette butts all over the campsite. AMEN!! !Don’t get me started. Why do campers think putting cigarette butts in a fire pit is ok? We pick them out and comment on IQs depending on how many there are. Lots of zeroes out there. Thank you to y; all who know how to camp. Also, your kids won’t die if you camp where there is no signal. Neither will you grownups! Remember why you want “to get away from it”. I just have to chose in here, I’m born and raised in Colorado, lived here my whole life, all 70 years, I’m so disgusted with the way humans are treating our state that I have a hard time even going camping anymore. Most recently in the area close to Denver in the foothills in Jefferson county the state had to close a certain dog park because the people were not picking up their dogs wast and rain and snow was creating run off into the stream that runs close by and it was fouling the creek to the point that it was listed as a hazardous waste site, spoiling the creek for many miles and even causing Elk and Deer to become sick from the toxins. Oh man did the self righteous people that abused the park cry their self centered eyes out! In my opinion, they got what they deserved, just maybe, maybe those idiots that created the problems will wake up and get some common sense!